In 2003, I decided to go on holiday to Bucharest in Romania, and experience life in this unusual ex-Eastern Bloc country. I was hooked by what I saw, and the sense of discovery as I wandered through the streets, alone, seeing how people were living in this post-Communist society. Every opportunity I had since then I travelled through Eastern Europe to Bosnia, Kosovo, Albania, Serbia and then into the ex-Soviet republics of Belarus, Ukraine, Moldova and Georgia. Next stop was Armenia. I knew nothing about Armenia. When I mentioned about going to Armenia to friends and colleagues most would frown, and ask where it was, and nearly all would say. Why? In doing some research at the time I was reminded of the war in Nagorno-Karabakh which I recalled, faintly, from being on the TV news in the early 1990’s but was not sure about the background to it. I had also seen an excellent documentary a few years ago called “A Story of People in War and Peace” which was filmed by somebody embedded within the Armenian/Karabakhi partisan armies. There was something about the grit and determination of the people which fascinated me, and moved me, which lay dormant for a few years. During my first visit to Yerevan in 2009 I walked to Yerablur cemetery on Independence Day at the same time as a large group of ex-soldiers. At the cemetery, I walked past the many lines of gravestones, looking at the images of the faces of the dead, watching the old soldiers contemplate their fallen colleagues, lost in their memories. There were women who had lost husbands, and children who had lost fathers – a lot of them had died very young. One of the faces I recognised from the documentary was a man with a beard – I think it was Avo. The scenes and emotions from the documentary I had seen a few years ago came flooding back, and the struggle and rawness of that war was clear to me. It was at this point that I felt that I needed to go to Nagorno-Karabakh and experience the place for myself. 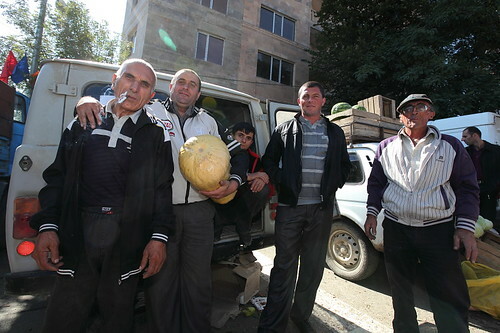 Back in Yerevan, I took the chance of going into a tour office and asked if they could make arrangements for me to go on my own with a driver and guide. They agreed, and so the scene was set for my next visit to the South Caucasus. The UK Foreign Office gives clear statements on travelling to Nagorno-Karabakh in their Travel Advice pages. The advice given is “The British Embassy cannot give you consular assistance if you are in the Nagorno-Karabakh region”, and “We advise against all travel to Nagorno-Karabakh and the military occupied area surrounding it”. Despite such clear warnings I continued with my original plan. I remember my first journey to Artsakh, and being on the Goris-Stepanakert road, just inside Armenia, looking eastwards at a full horizon of mountains, in wonderment. I was excited that our journey to Shushi was going to be through this magnificent landscape. We weaved through the mountain passes and I was entertained throughout the whole journey by the scenery and my thoughts about the recent history. The rocky outcrop of Shushi eventually came into view – like a fairy-tale fortress, with a tragic history. As we pulled off the main road, and drove slowly through the town, the reality of the war struck home. Most of the buildings were still severely damaged, and I had an awkward sense of alienation. I did wonder how I was going to deal with this and what the next few days would hold. This was so different to what I had previously experienced. We took the opportunity to walk around before we checked in to our accommodation, and I was slightly unnerved by some of the attention I was getting. My instinct from being in the UK, was to be on my guard. My Armenian guide, Gayane, approached a group of youths who were being vocal; I was concerned that they were being abusive and intimidating, but as I did not speak Armenian it was difficult for me to judge. It transpired that they just wanted to know if they could help us. I smiled and realised I was in a very different place. I had the good fortune to be staying at the house of Saro Saryan who is a master of making you feel very welcome, and enthusiastically showed me around Shushi, recalling intricate details of its history, and the people living there. My time there was short, and Saro’s prophetic words were, as I left “ We will see you again, Russell, I’m sure”. Whilst I was affected by the conditions and how people were living, I also left feeling their warmth, and friendliness. When I got back home, and reflected on my short stay, I just knew I had to go back, and continue with this unfinished business. Since that time I have been back 3 times, and each time I have met more people, seen more of the scenery, and become increasingly more aware of the current situation and the resolve of the people to deal with it. In that period I have developed as a photojournalist and through the people I have met, I have enjoyed the opportunity to understand and engage with them – and, also, to make some good friends. In a small way I want to be able to educate and inform people, particularly in the UK, about what is happening in Artsakh, the complications of the political situation, and the potential terrible consequences if the current cease fire is not brought to a satisfactory conclusion. Living in Artsakh has many opposites to living in the UK and that contrast can create many unique perspectives. It is too easy to be complacent about how insignificant our problems are compared to those in Artsakh. We are a rich nation of 60 million people, living in an island state, an established presence on the world stage, with no fear of being attacked, and 1000 years of parliamentary democracy and stability. The 150,000 people in Artsakh don’t have any of this – but they do have a richness of community spirit and identity, which spurs them on to re-build their country, despite unusual and very difficult political and economic conditions. It is this that I find enduring and very captivating. That’s what brings me back, time after time.